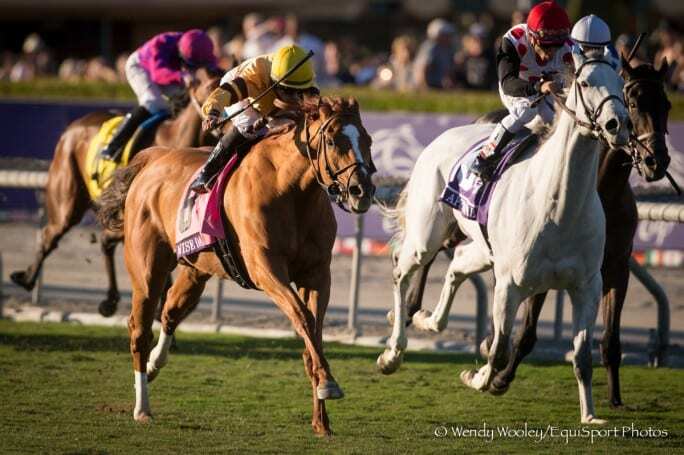 In a truly incredible day of racing, Patti and Dean Reeves’ MUCHO MACHO MAN held off a late charge of WILL TAKE CHARGE and DECLARATION OF WAR to win the 2013 Breeders’ Cup Classic by a nose. It was the first by a female trainer in the Classic for Kathy Ritvo, and the first-ever classic win for Hall of Fame-jockey Gary Stevens. Talk about unbelievable comeback stories in sports. Stevens has had quite the year winning the Preakness Stakes back in May with Oxbow and the Breeders’ Cup Distaff with BEHOLDER on Friday. Michael Jordan came back after a two-year leave to play basketball again in 1995, and then led the Bulls to three-straight NBA Championships. Jordan kept in shape playing baseball in his two-year break, not like he was a TV personality as Stevens was for six of the seven years he was retired. When Jordan returned to the NBA in ’95, he was also 32. Stevens’ age? 50. He was the oldest jockey ever to win a Preakness. Stevens and Jordan were born only 17 days apart. When Jordan came back after his second retirement at age 38 in 2001, he was nowhere near as successful as his first comeback. He did not win any championships or awards while playing in a Wizards uniform. Imagine what it would be like if Jordan came back now at age 50. A joke, right? After winning the two biggest Breeders’ Cup races of 2013 and a Classic, it’s hard to argue that Stevens is past his prime. 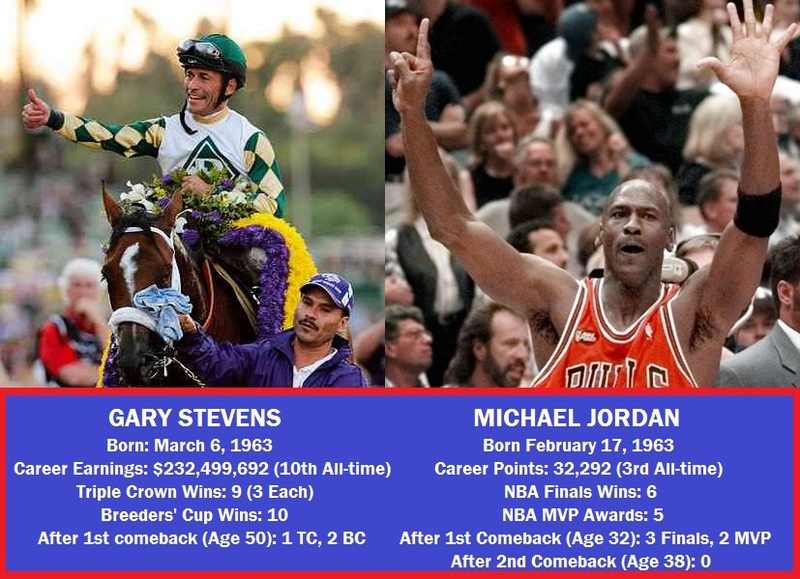 To this point, Michael Jordan was clearly a better NBA Player than Stevens has been a jockey. But at age 50, Stevens is showing no signs of slowing down so who knows what the future might hold. 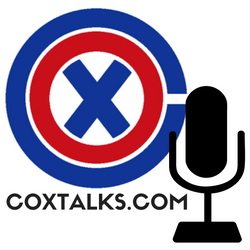 A lot of sports websites address best comeback games, but not necessarily stories for an individual’s career. Here is one dated article I found from ’09: “Top 10 Comeback Stories in Professional Sports.” I definitely left out a few that you could throw in the mix, so let me know if you think someone else should be considered. I had four out of the nine winners if you saw my picks on yesterday’s blog. The Breeders’ Cup at Santa Anita was a tremendous experience and I can only pray I get to go back again next year. Giddy up.